The windy city was the back-drop to Jennifer and Michael’s wedding this past September. 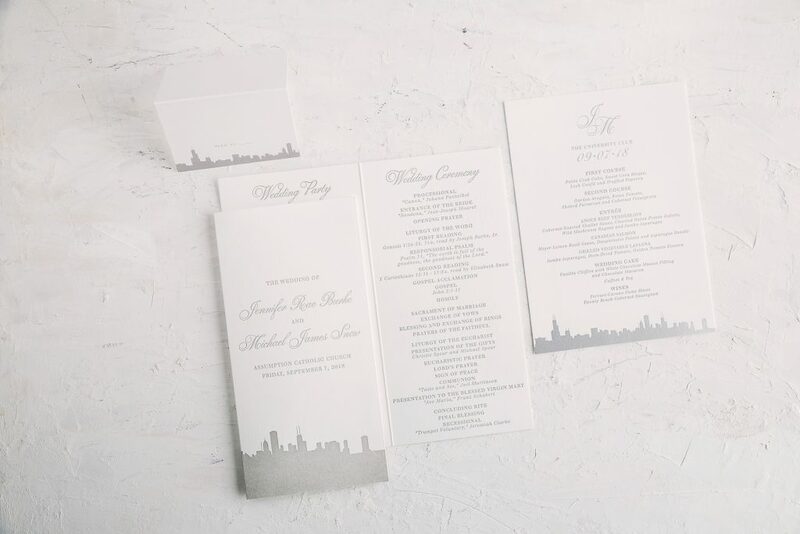 The couple worked with Magnificent Milestones who helped bring their Chicago skyline wedding invitations to life. 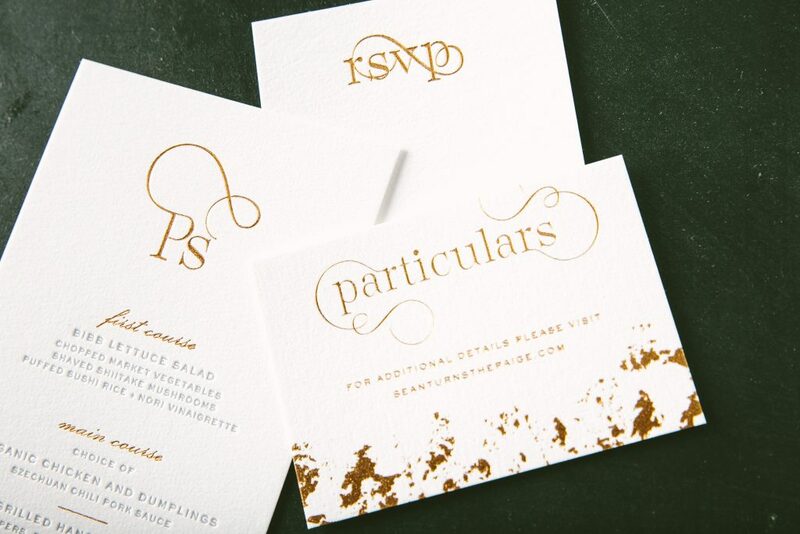 Silver Matte foil and Shale letterpress ink kept the color palette cool and harmonious. 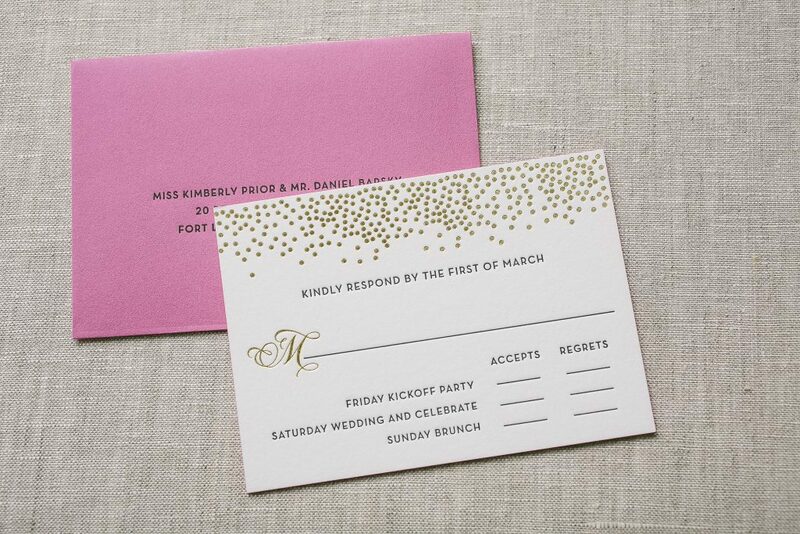 The suite contained a corresponding reply card, details card, as well as a monogrammed thank you set to match. Finally, the pocketfold printed with a geometric pattern kept all the pieces together. The couple also took advantage of our day-of promotion and ordered matching programs, menus and place-cards. 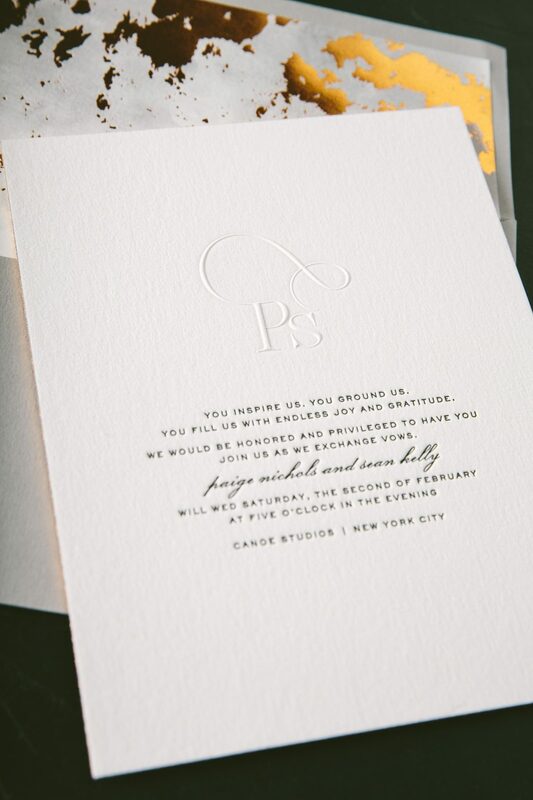 We worked with our friends at Ipanema Press to create these crisp black letterpress wedding invitations. 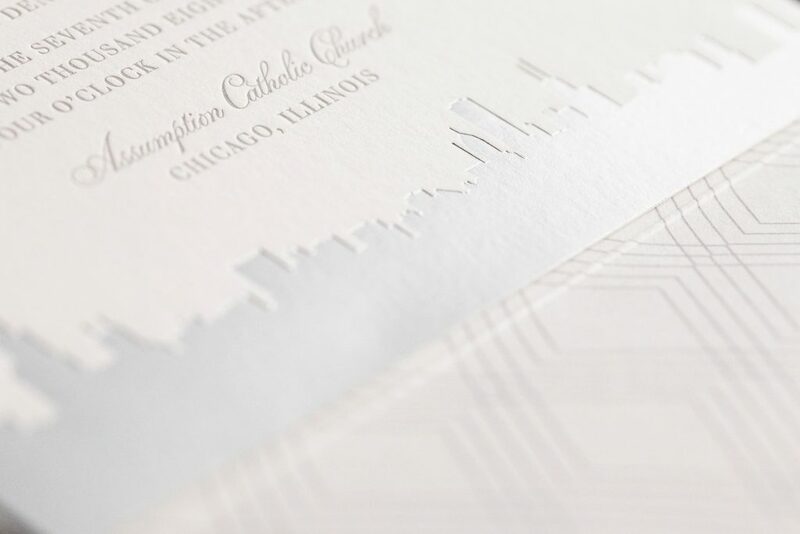 Above the letterpress, a blind embossed monogram added dimensional texture. Whereas, a pop of copper foil used on the reply as well as website cards introduced metallic accents. 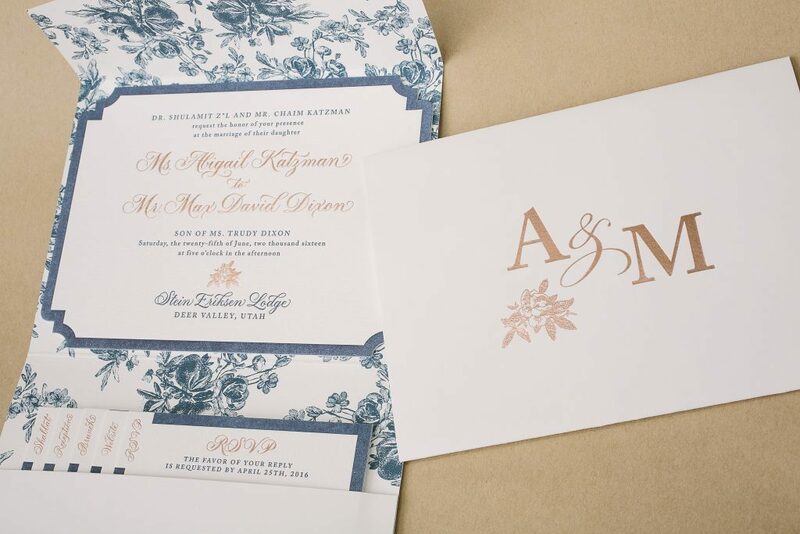 An envelope liner finished the set off in a custom pattern shining in copper foil. 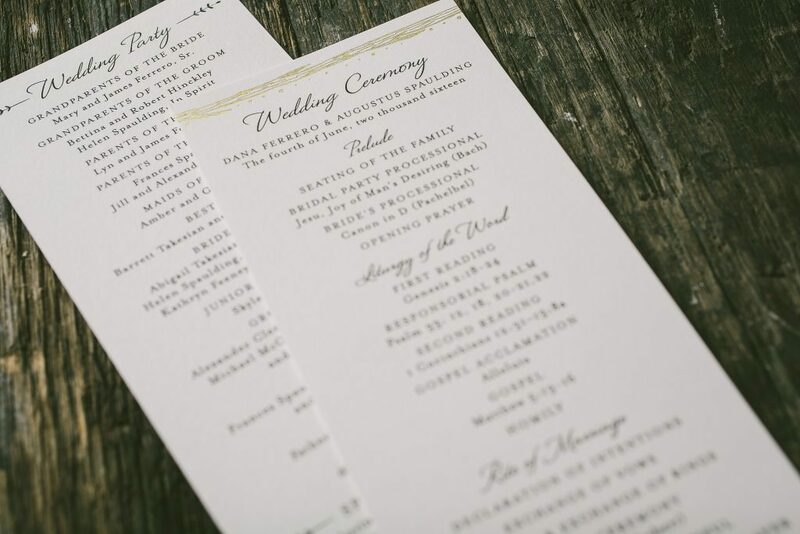 Finally, a menu printed in copper and black letterpress ink kept everything cohesive. We’re also happy to announce that we are extending our day of promotion through December 2019! Abby and Max worked with our friends at Rock Paper Scissors to customize our Chatsworth design for their Deer Valley, Utah wedding last summer. 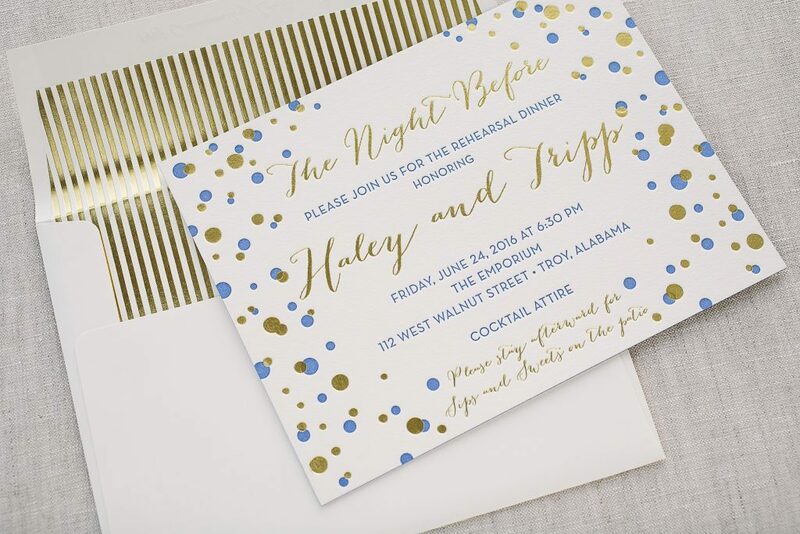 From their Imogene save the dates to their ceremony programs and menus, Abby and Max used a cheerful palette of navy and rose gold and used a combination of hand calligraphy styles from Sarah Hanna and Elizabeth Hardin to highlight important text on their suite pieces. 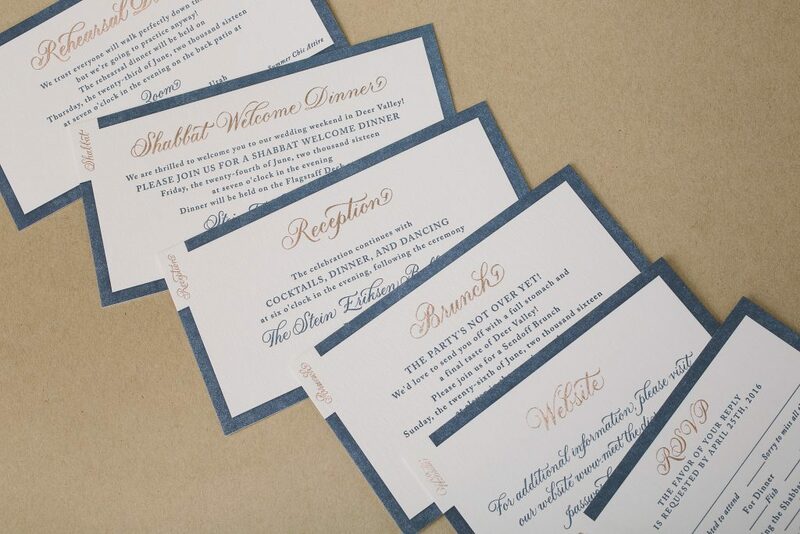 They added our lincoln diecut shape to the invitation for an added bit of interest and used our elegant garden pattern as an all-over pattern on the interior of the pocketfold. Their accessory cards were sized and stacked within the pocket so no card would be missed. 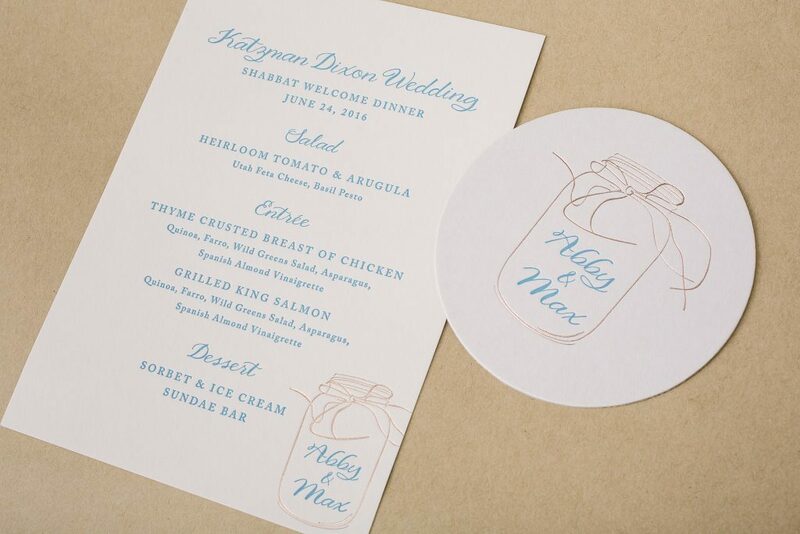 The menu and coasters for their Shabbat welcome dinner were printed in rose gold and cerulean ink while the mason jar motif from our library gave a less formal, more fun feel to the pieces. 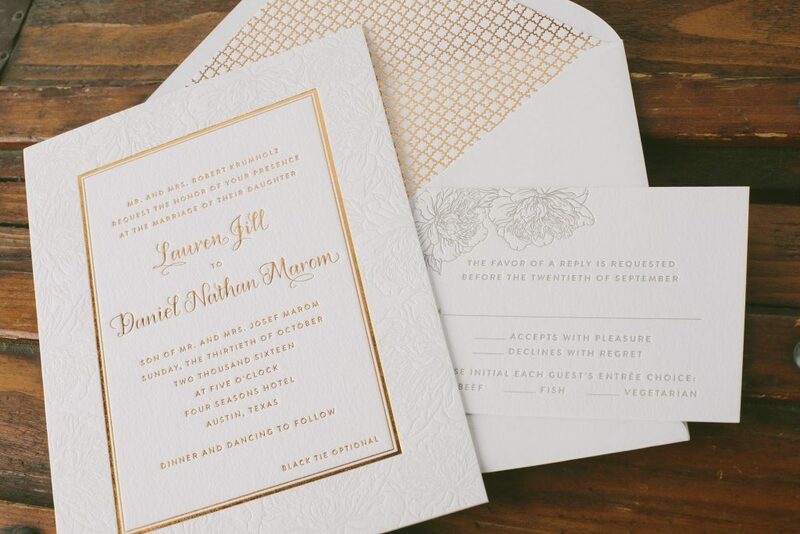 Diana and Simon chose our ivory cotton paper to soften their palette of rose gold foil and taupe. 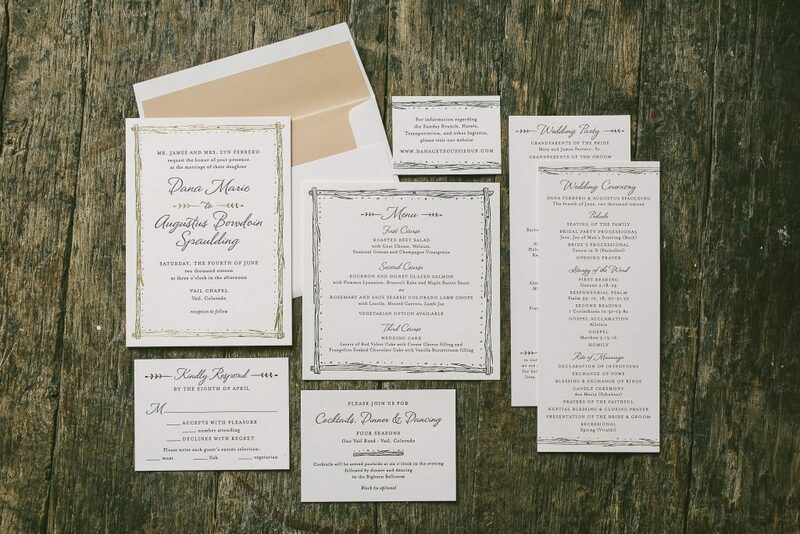 Sarah Hanna’s hand calligraphy added an elegant formality to important text on the invitation and additional suite pieces. Lauren and Daniel opted for a more modern presentation by using the floral artwork as a border printed in pale gray. Copper shine foil and Debi Zeinert’s hand calligraphy gave the design a contemporary yet still classic feel. 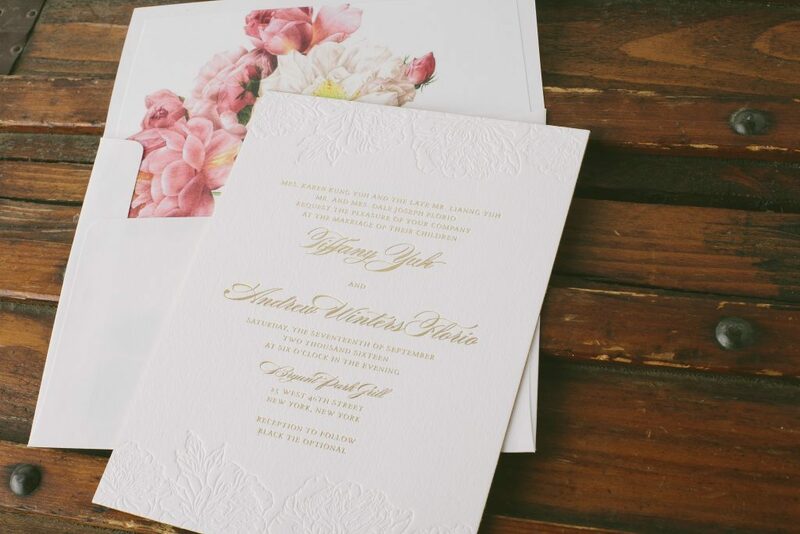 Meaghan and Peter chose a modern layout with the floral artwork printed in inkless blind deboss and the text in rose gold foil. 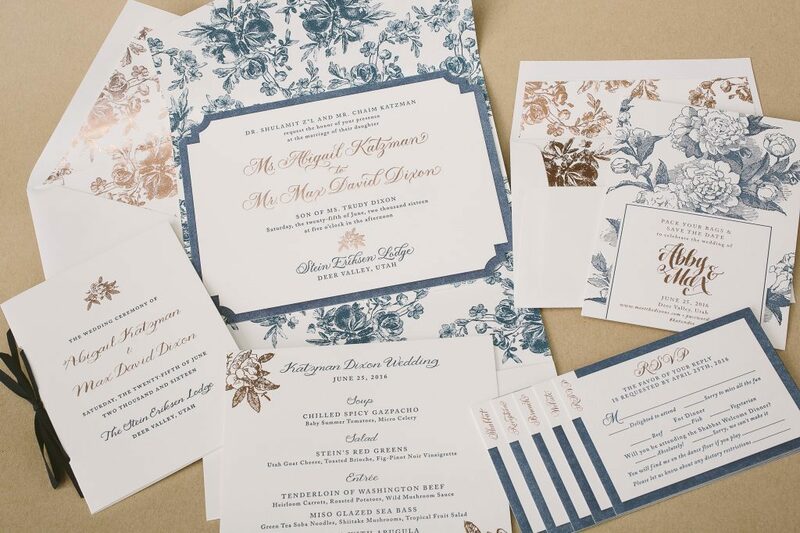 Vine ink was used on the accessory pieces and tied in the custom envelope liner that incorporated more of the Jorie florals. Tiffany and Andrew also printed the floral artwork in inkless blind deboss but used it to frame their text that was printed in gold matte. 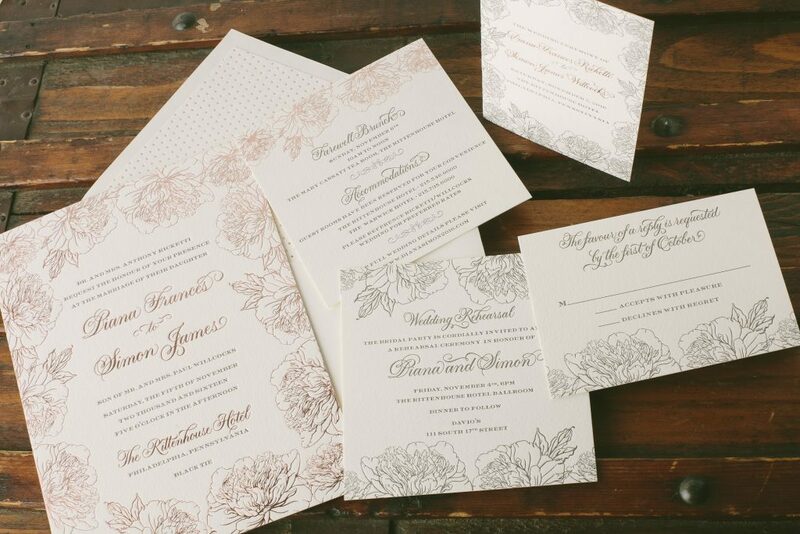 They used one of our vintage print floral liners to add romance and color to the otherwise neutral invitation. 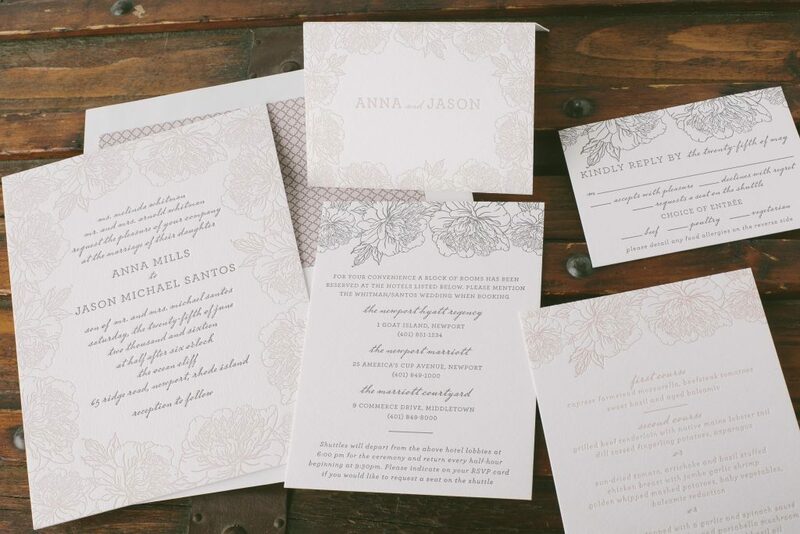 Anna and Jason kept the layout the same but chose a palette of pewter and dusty pink that complemented the simple hand drawn look of the floral artwork. They carried their palette throughout the suite that included an accommodations card, thank you cards and menu. 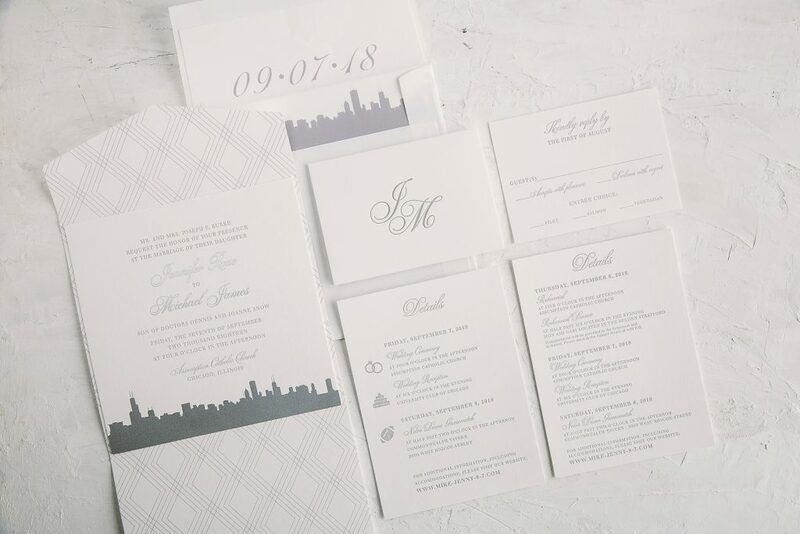 Thanks to our friends at RSVP Today, Paper Place, Pulp and Ink, Village Invites and Invitations & Company for helping these couples customize our Jorie design for their weddings! 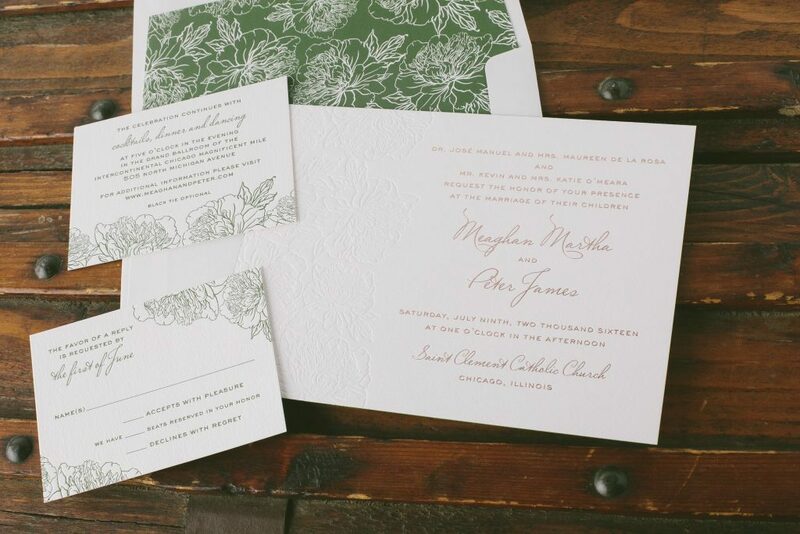 With the help of our friends at Wordshop Dana and Augustus transformed our Woodland design into rustic wedding invitations for their Vail, Colorado wedding. 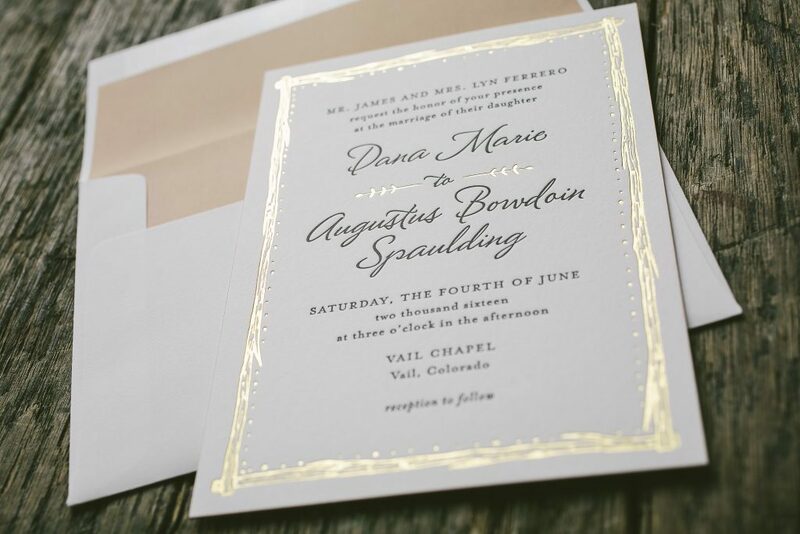 They chose the illustrated branch border from the save the date as the design for their invitations and carried that theme throughout their invitation suite and day-of pieces. 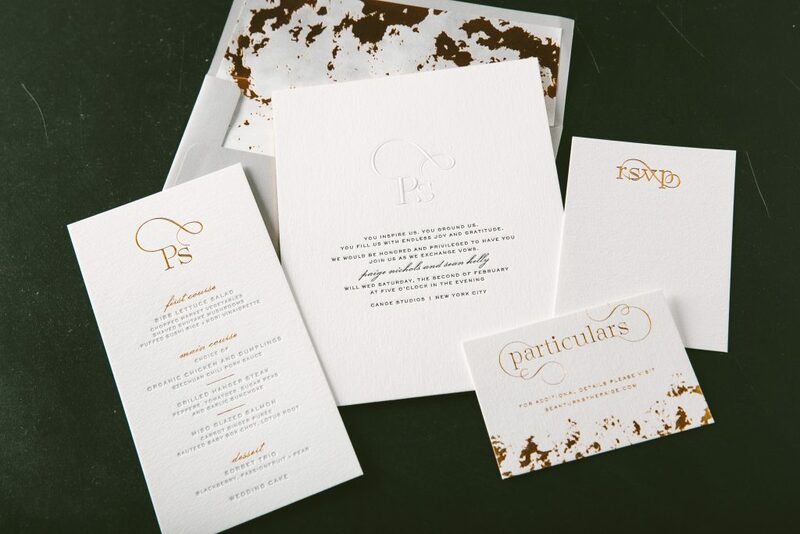 Their color palette of gold shine foil and black letterpress added elegance and conveyed the formality of the evening. We printed these black and gold wedding invitations for Kimberly and Daniel’s Miami Beach wedding. Our friends at Papery and Cakery helped them customize our Joie de Vivre design with hand calligraphy, a contemporary layout and custom fuchsia envelopes that perfectly matched the painted edges of their cards. 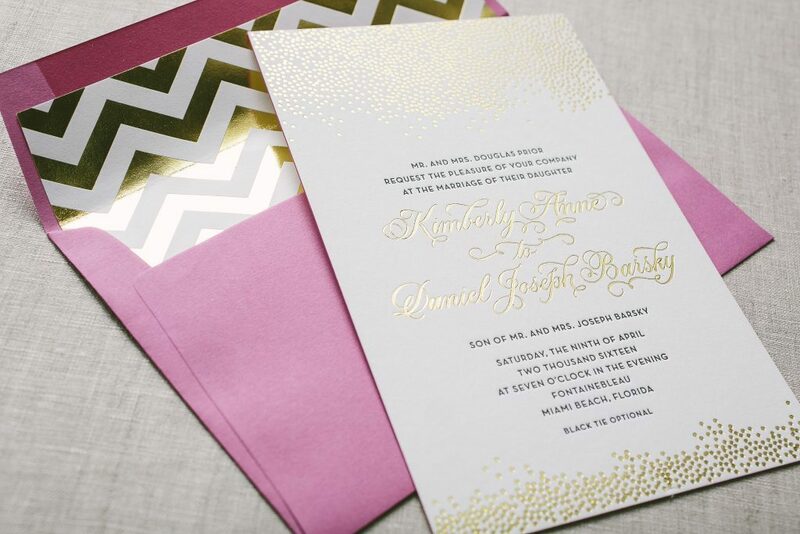 A chevron envelope liner printed in gold shine foil and cute bow ties on their menu provided touches of festive fun. 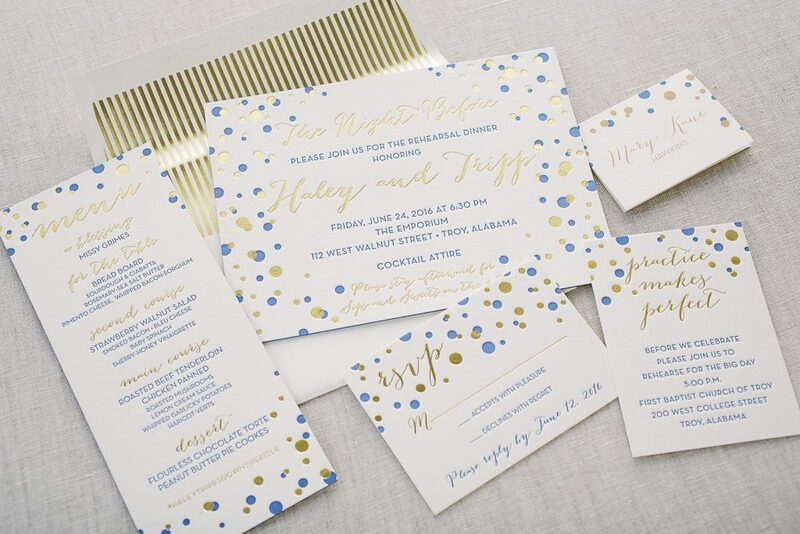 With the help of our friends at Prickly Pear Press we printed these fun and festive rehearsal dinner invitations for Haley and Tripp, using our Modern Revelry design as inspiration. 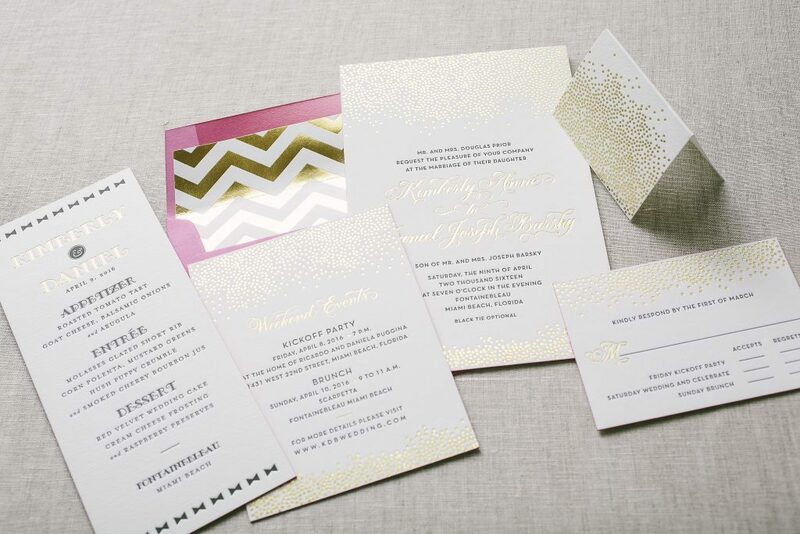 Their bold color palette of cobalt and gold shine foil was used throughout the suite – even on the cobalt edges of the invitation and menu. 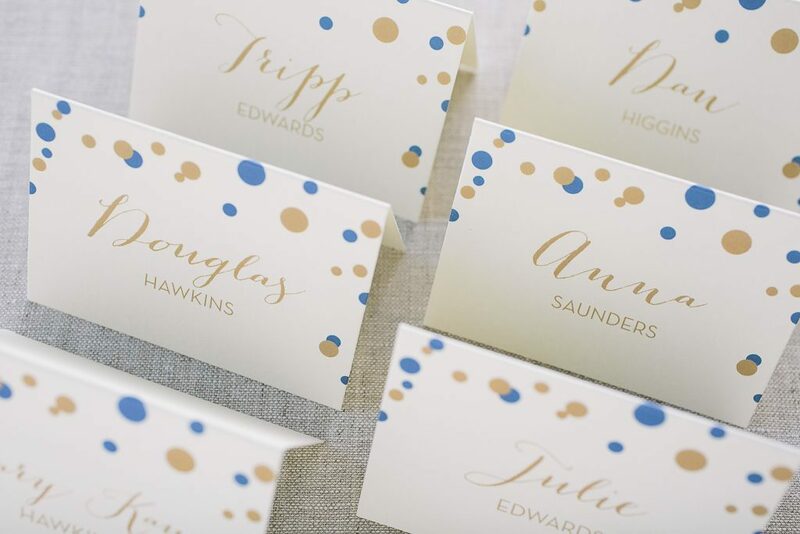 We digitally printed their guests’ names on the placecards, too!